The benefits of using local stone in a building's structure are multifold. It's a sustainable resource that can reduce transportation costs and energy, can last hundreds (if not more!) of years, and speaks to a local sense of place and character. Stone in general is often selected by architects and designers because of its visual and textural characteristics. Aesthetically, stone is a great material to build with, because it can take on an endless range of shapes and sizes. It can also be finished in a variety of ways: hand-tooled for texture, honed for a matte finish, or polished for a reflective surface—and can be utilized for walls, roofs, flooring, and even tiling. While many people may source their marble tiles or granite countertops from across the globe, local stone can be used in countless ways. 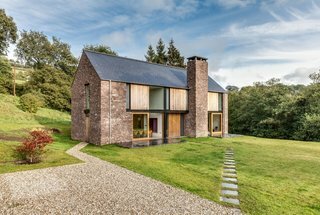 Here, we’ll take a look at a few different examples of how local stone can be used at its best. 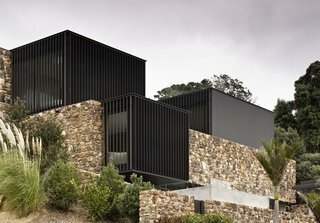 On Waiheke Island in Auckland, New Zealand, local architecture firm Pattersons Associates Architects designed a home that's constructed out of pyrite strata, a durable local stone with a wide variety of color tones that results from its embedded minerals. 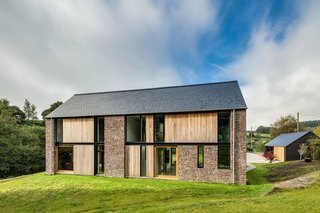 Rather than shying away from the variation in colors, the architects chose to embrace it, pairing the earthen shades of the stones with an equally rustic tooling. Because of its density, the stone is very heavy and therefore stacks well, facilitating its use as vertical elements in the design of the home, both on the interior and the exterior. By working with the advantageous aspects of pyrite strata—including its ease of stacking and diverse color range—the architects ensured that it would be both aesthetically pleasing and structurally true to its abilities. The rear of the house has a pool and patio that features smooth concrete, which contrasts with the varied texture and color of the stone walls. 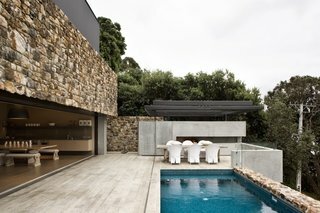 Stone walls surround the patio area and the edge of the pool. 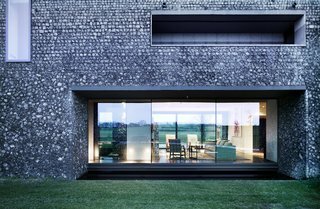 Local stone was used also used on selective interior walls, reflecting the exterior facade. In Vrhovlje, Slovenia, strong regional winds exposed a vast amount of limestone under the top layer of the earth, providing typical construction material for centuries. Limestone is a strong, dense stone with few pores, which makes it great for cold, windy regions where building materials should be able to withstand abrasion and freeze-thaw cycles. 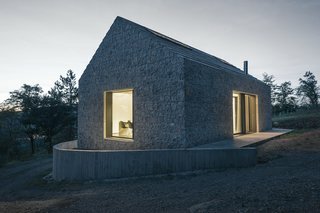 In Slovakia, the home is in an area that's well-known for its limestone repositories. 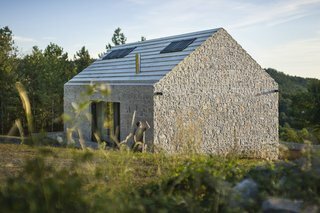 Rather than ignoring the long history of small, gabled limestone residences in the area, dekleva gregorič arhitekti chose to follow this tradition in a modern way. The exterior consists of load-bearing concrete walls with chunks of local limestone embedded into the concrete. 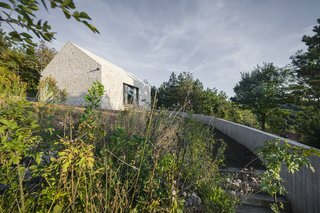 The approach to the home is defined by a concrete wall and gravel path. 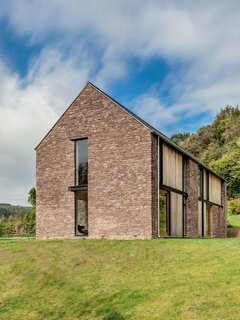 One of the three large windows in the home is positioned on the end gable that looks out onto the landscape. A stepped concrete roof continues the varied texture of the house's exterior. 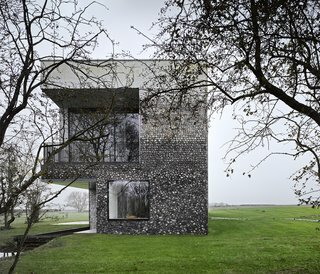 Located on a remote island in the English countryside, Flint House was designed by Skene Catling de la Peña to be a residence for the curator of an archive building on a vast estate in Buckinghamshire—one of the few locations where flint can be found in the U.K. As a result, the architects sought to exploit this unique stone, which is known for its hard, sedimentary qualities as a form of quartz (during the Stone Age, tools like axe blades were often made of flint). It frequently has a glassy or wax-like surface, especially when chipped or split, and can range from dark gray to black, white, or brown in color. It's this color palette that inspired the architects to create an exterior with a facade that morphs from larger, irregular dark gray stones to lighter, more rectangular, smaller stones as the building rises from the ground. This ultimately gives way to large, smooth blocks of white chalk. 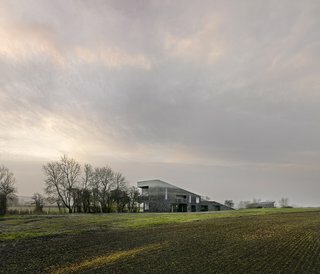 By playing with the natural texture, shape, and colors of the flint and contrasting it with the smoother texture of the chalk blocks, the architects created a building that's uniquely tied to the land. From a distance, the fading of the flint reflects the range of colors of the outlying landscape. 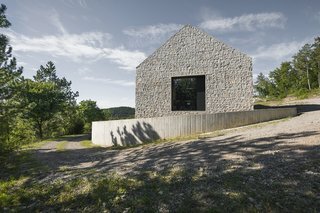 A dark, almost black mortar on the lower portion of the home makes it feel grounded in the landscape. 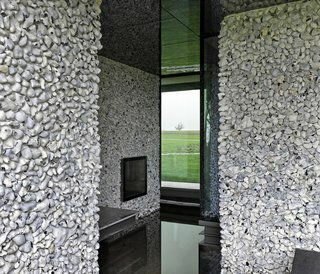 On the upper floor, smaller stones of lighter colored flint cover the walls. 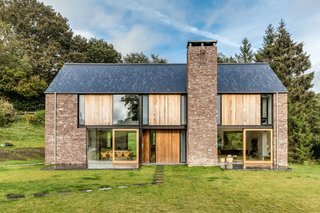 With a local sandstone quarry only three miles away providing the desired building material, this home designed by Hall + Bednarczyk Architects in Peterborough, England, similarly capitalized on the availability of local stone for its facade. The reddish hues of the sandstone are created by the iron oxide, or rust, but it remains resistant to weathering. Although sandstone is available in a range of colors, this region’s reddish sandstone can be quite consistent in its tone. However, because sandstone is made of sand-sized minerals or rock grains, it's very easy to work with and relatively soft. So, the architects expressly decided to hand-dress the stones to create smooth surfaces, knowing that moss and lichen might grow on the facade as the building ages. Here, the architects considered both the current characteristics of the stone, as well as how it would age over the years. The reddish tones of the sandstone are from iron oxide deposits in the local stone. The end gable of the house is covered in local sandstone. The other facades have wood panels as well as local red sandstone.